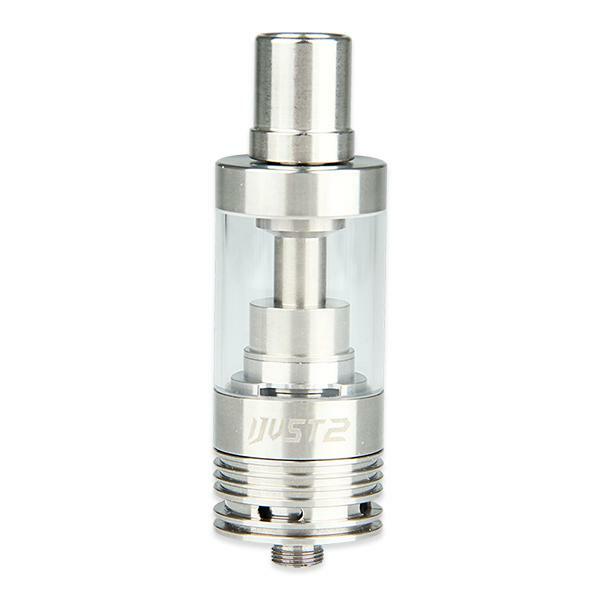 The ijust 2 atomizer is a 5.5ml e-juice capacity tank. The diameter is 22mm. The ijust 2 is best compatible with ijust 2 battery. Eleaf iJust 2 Pyrex Glass BDC Atomizer features 5.5ml huge liquid capacity despite its light weight. By adopting dual coil EC head, it can handle up to 80W and make large cloud production. The special structure design for iJust 2 atomizer standard base improves the heat dissipation capacity to a large extent. • EC head is adopted in iJust 2 atomizer, which is consisted of two heating coils vertically placed in parallel. It enables a large amount of cloud production. • The large capacity of atomizer tube reaches 5.5ml, which is more convenient and user-friendly. • The special structure design for the iJust 2 atomizer standard base improves the heat dissipation capacity to a large extend. • The amount of airflow can be adjusted by rotating the airflow control ring on iJust 2 atomizer standard base so as to get different vaping experiences. • There is CE mark on the bottom base. iJust 2 works nicely, good price here. Would recommend. Love my new eleaf iJust 2, huge tank for more juice, flavor and vapor production both decent. The package came fast,I'm very pleased and recommend the seller! 5 +++++ Everything works perfectly! Also comes with extra tube and coil,especially the Airflow Control Ring,I love the color so much,prefect!